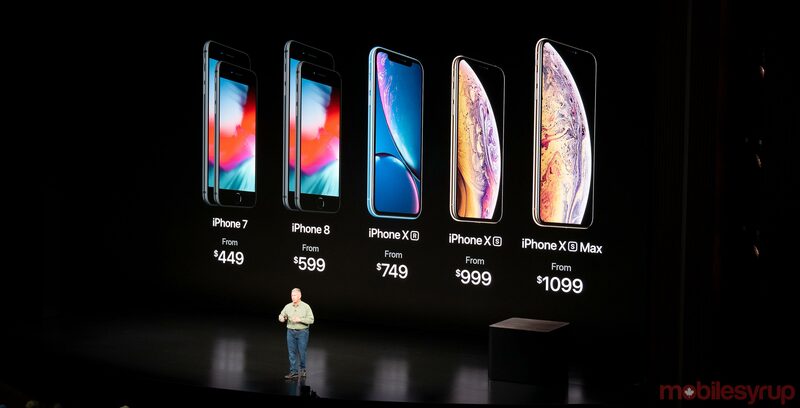 Apple unveiled its latest trio of iPhones today, the iPhone XS, iPhone XS Max and iPhone XR. The iPhone XS and XS Max are set to launch on September 21st, with pre-orders for the devices starting on September 14th. The more affordable iPhone XR ships on October 26th and pre-orders start October 19th. The 5.8-inch iPhone XS starts at $1,379 CAD. The 256GB iPhone XS retails at $1,589 and the 512GB variant costs $1,859. Meanwhile, the 6.5-inch iPhone XS Max starts at $1,519, the 256GB variant costs $1,729 and lastly the 512GB retails at an astonishing $1,999. The 6.1-inch iPhone XR starts at $1,029, the 128GB variant retails at $1,099 and the 256GB iPhone XR costs $1,239. So far, we only have carrier pricing from Rogers and Fido. At Rogers, the 64GB iPhone XS will start at $429 on one of the carrier’s new two-year ‘Ultra‘ plans, the 256GB version is $629 and the 512GB is priced $889 on a 2-year. The 64GB iPhone XS Max will start at $559 on a two-year Ultra plan, the 256GB model is $759 and the 512GB version is priced at $1,019. At Fido, meanwhile, the iPhone XS will start at $659 on a two-year XL plan, while the iPhone XS will start at $789 on a two-year XL plan. At Canada’s second largest carrier, Bell, the iPhone XS starts at $659 on a two-year contract, while the iPhone XS Max starts at $789 on a two-year plan. Other carriers that will sell the iPhone XS and iPhone XS Max include Cityfone, Eastlink, Freedom Mobile, Koodo, BellMTS, PC Mobile, SaskTel, TbayTel, Telus, Videotron and Virgin Mobile.